So we are here and I have done as I threatened and taken pictures of it as it was when we arrived (except for the boxes and boxes of plants). Not as big as the old place, but plenty of room to play and definitely needing a lot of TLC. Gail-Steman, Kay, Catdaddy6676 and 2 others like this. Oh wow. that is a lot of plants to replant. the house is cute. how far did you move? That is nice Palustris! You still have lots of room to play! I can almost feel the itching in your fingers at the thought of dealing with your new garden. I'm excited just looking at it. Will you be keeping the summerhouse? What about the free standing wall? Have you an idea of where you'll be putting all your plants? Will you be keeping any of the existing planting? Have you thought about having a pond? Oh sooo many questions!! It will take time but I'm sure you're not afraid of hard work and, before we know it, you'll have it ship shape. 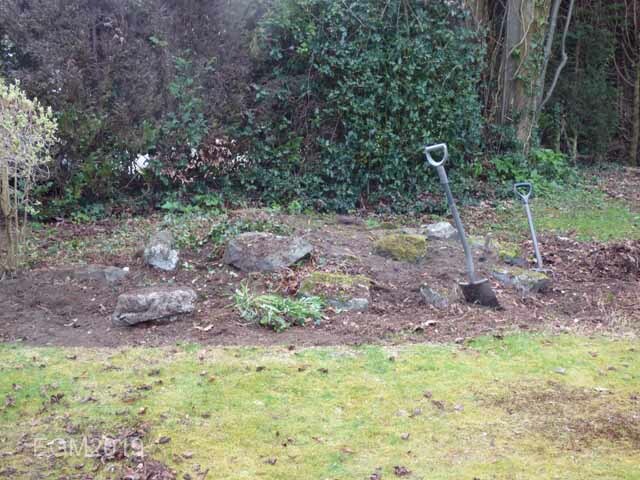 Enjoy your new home and do let us see your progress with the garden won't you? We moved 6.1 miles. I know as I did 7 trips with plants in the car loaded to the gunwales. No decisions made as yet, except that some of the Conifer hedges will have to go as I can no longer reach up to trim them. And I am slightly allergic to resin. No pond, ever. .Dozens of Hydrangeas macropetala will have to be removed as neither of us are very fond of them. I have added some pictures of the more problematical areas with massive conifers and laurels. Gosh you have your work cut out for you with those conifers. Will you tackle them yourself or get someone in to do the job for you? The hedging ones will have to be done by the fencing company. Not sure about the rest of them. We will have a go first and see if we can do it. Palustris, you can tell a true gardener when the carport is occupied by transplanted plants rather than a car! You do have your priorities right! I like that you took photos from inside the house looking out. That is always an important aspect, to consider what the garden will look like from inside. I agree with you about those conifer hedges. I am glad you are taking some out: they are too tall & foreboding. You have some nice plant material there. I think I saw some rhodies, maybe a deciduous Japanese maple? A lot to work with. BTW I think your home is charming! I like the front gate & slightly winding driveway. Also that summerhouse....that has possibilities! I wish you well with it all! Please let us know what you do & show us photos! The slightly winding driveway could be a bit of a problem in that it is shared by four properties and there is no formal ie legal agreement as to how it is maintained. The neighbours we have met so far have been very friendly and welcoming. Congrats on your new home! It appears that you’ve inherited another’s garden that was full of love. I like the various stone features as well as the unique patio. So time to roll up your sleeves and get to the work you love!Enjoy! Lovely place ! Congrats ! Yes, we can see that you will have a lot of work to do at your new home. I do not know how much you will change, but just the maintenance of it all will be a hand full. My Bride and I sat down to look at your piccies. We really liked them a lot. I see that you guys made the sensible choice of a bungalow. My Bride exclaimed--"How is he going to keep all that up"! She seems to think that you must be ancient or something. Don't worry, I had a word with her. hahaha. It is looking very good, considering the time of year. Is it very windy there? Not been here long enough to really check the weather out. Seems a little less Frost prone than the other place which was a frost pocket. Biggest problem we can see is the number of tree stumps left in the ground and their associated roots. 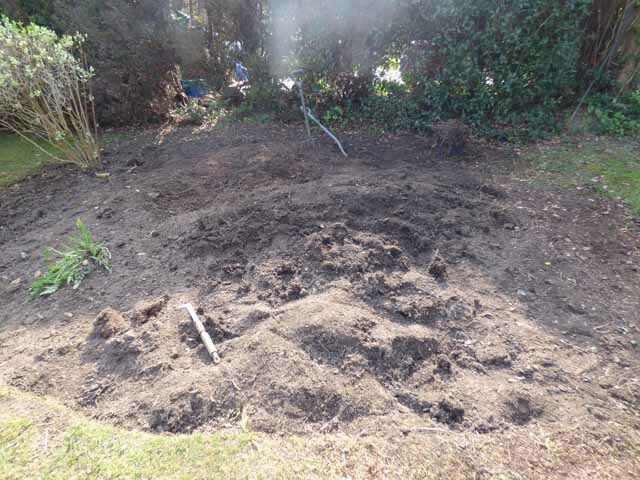 Makes digging rather difficult, but we have removed one big one already. We plan to change a lot of it to be honest. It is full of Hydrangeas which we are not keen on and lots of bits of lawn which will be difficult to get a mower on to. Idea is to make it a woodland garden and very low maintenance. We shall see. Sjoerd, Cayuga Morning and Odif like this. Spent the last few days clearing out one bed in particular. It had a huge tree stump in the middle of it and roots all over. There were some very large rocks randomly scattered over it. Not very pretty, covered in Ivy and other weeds. 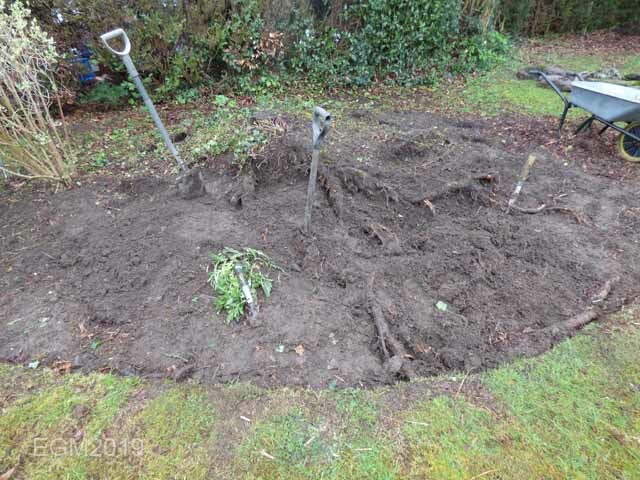 So I removed the rocks, exposed and used my chain saw on the roots (And there were a lot of them and thick too). 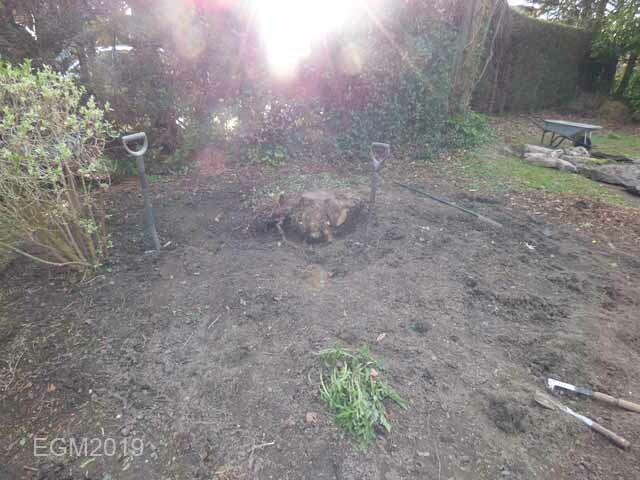 Fortunately the stump had no roots going down into the soil so once the side roots were removed it came out of the ground. Took both of us to get it into the barrow though. 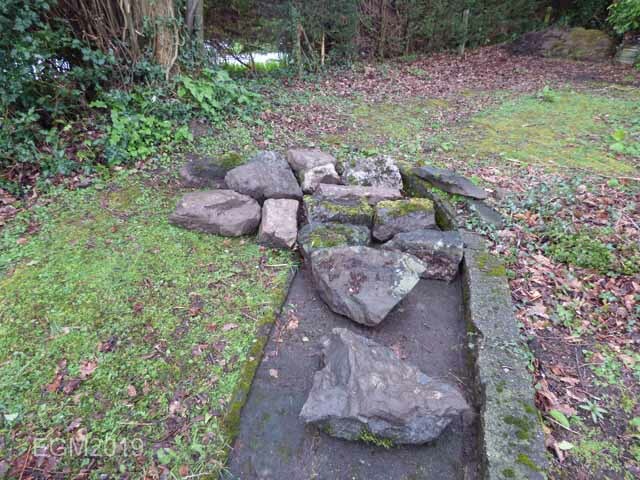 Now all I have to do is dig it over and replace the rocks. Gail-Steman, Sjoerd, Frank and 2 others like this.